Using original and archival material, The Right to Privacy traces the origins and influence of the right to privacy as a social, cultural and legal idea. Richardson argues that this right had emerged as an important legal concept across a number of jurisdictions by the end of the nineteenth century, providing a basis for its recognition as a universal human right in later centuries. 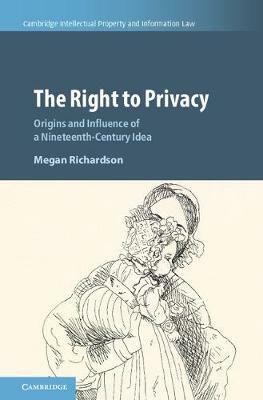 This book is a unique contribution to the history of the modern right to privacy. It covers the transition from Georgian to Victorian England, developments in Second Empire France, insights in the lead up to the Bürgerliches Gesetzbuch (BGB) of 1896, and the experience of a rapidly modernising America around the turn of the twentieth century. It will appeal to an audience of academic and postgraduate researchers, as well as to the judiciary and legal practice.